The architectural heritage of the city’s main commercial hub, Sector 17, is in a state of decay with no uniform policy being formulated for its repair and restoration over the years. The report of the sub-committee formed as part of the expert committee for the preservation of architectural heritage of Chandigarh comprising UT Chief Architect Sumit Kaur, Punjab Engineering College University of Technology Director Manoj Datta and Chandigarh Housing Board Chief Engineer GS Rosha has observed that vagaries of weather and lack of maintenance are telling upon the condition of major buildings in the sector. “Though there is no major threat to the stability of these structures, there are definite signs of neglect because of poor/unplanned maintenance which the state agencies need to monitor through a well-defined maintenance protocol that will help in identifying crucial areas for consideration under any remedial/restoration works at a later stage,” the report says. During the preparation of the report, the committee found damage to the buildings in 17 Bays Building, Neelam Plaza (both in Sector 17), and Gandhi Bhavan, Fine Arts Building, Library Building and the Administrative Block at Panjab University and residential houses (Type 13) in Sector 22. 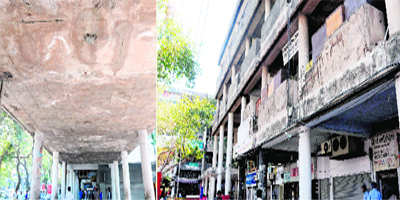 (Left) The spalling of the concrete cover of the columns of connecting passages of a building; and the vagaries of weather and absence of maintenance have taken a toll on another architectural heritage building, resulting in the cracking of certain parapets, in Sector 17-D of Chandigarh.